This 1902 structure in Plainfield, Wisconsin, was built as an opera house and performance venue, but over the years it has served as a dance hall, church, bar, and movie theater. Matt Makaryk, a Plainfield native who held his high school graduation party in the building in 1998, purchased it from its previous owner in 2011 for $2,500. Makaryk is a major in the United States Army and is currently stationed in Macon, Georgia. He’s undertaking a restoration of the structure that he estimates will cost about $250,000. In September 2016, Makaryk received an email stating that the Plainfield Village Board was going to vote to raze three properties, including the opera house. He reached an agreement with the board stipulating that he would repair the building’s back wall and roof by the fall of 2017. The back wall project was completed in June, and the roof reconstruction will be completed in November. 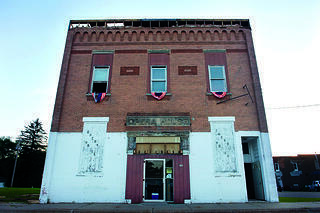 Ultimately, Makaryk hopes, the ground floor will be used as an event and community center, while the bedrooms on the upper floor will serve as a bed-and-breakfast when Makaryk and his wife and daughter aren’t staying there. He plans to reopen the building in 2023, after his retirement from the military. We chat with author Ann Satterthwaite about the history, rebirth, and future of small-town opera houses across the country.